solicited by Bob Quintero and Fred Dost to form a local chapter. The original group, chartered as Chapter #5 of the AFDCS. was called The Motor City Cover Club. 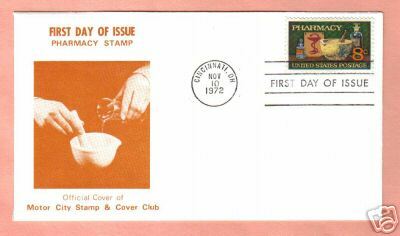 It was soon changed to The Motor City Philatelic Cover Club as many members believed that potential members didn’t know what a “cover” was! 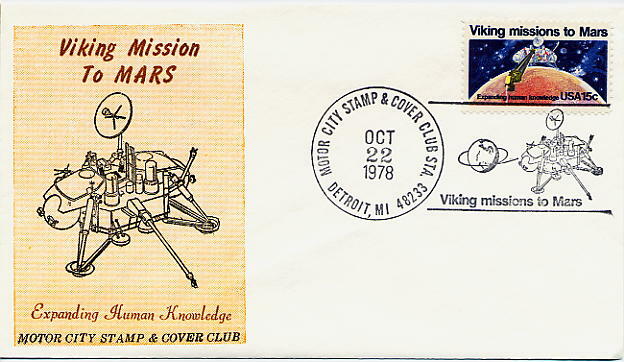 To end confusion and to accommodate the wide collecting interests our members, we adopted Motor City Stamp & Cover Club as our official name. Just two years later, the Detroit metro area’s fastest growing club was asked to host the AFDCS’s 4th Annual National Convention. It was a huge success with over 1200 attendees. Enlisting the aid of Leo August (with artwork provided by Bob Quintero) Artcraft produced our first cachets. On April 17, 1958, the MCSCC produced our own First Day Covers with the Brussels Exhibition (SC #1104) – Detroit being the First Day of Issue city. 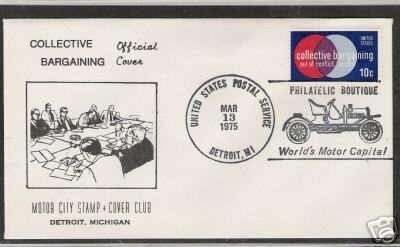 Since then, the club has covered all Michigan USPS First Days. We became members of the American Philatelic Society (#442), Society of Philatelic Americans and The Peninsular State Philatelic Society (#42) soon after. A few years later, we became Chapters of the Universal Ship Cancellation Society (USS Michigan #80) and the American Topical Association (#95). As our membership migrated outward from Detroit to the suburbs, so did our meeting places…..from Wayne State University – Detroit Public Libraries – The Detroit News building – Teamsters Headquarters - Peace Lutheran Church - to Sokol Hall…..the long-time site of our annual Motopex Exhibition and Bourse. 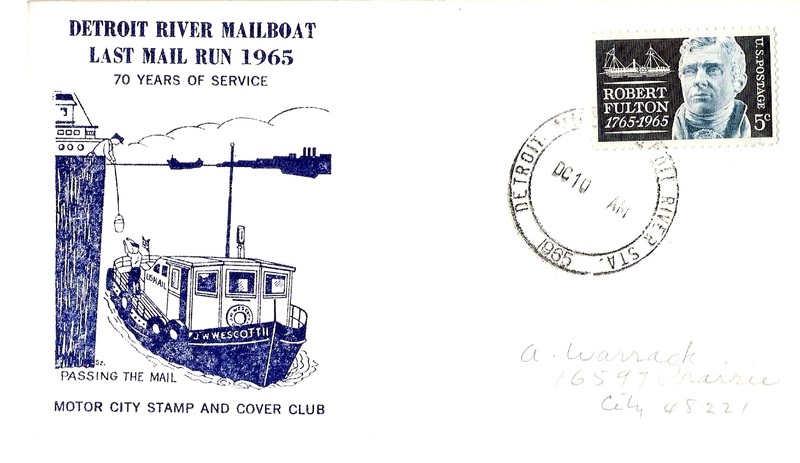 In 1962, the MCSCC began doing special event covers (opening and closing days) for the world-famous Detroit River Mail Boat operations and continue to this day. 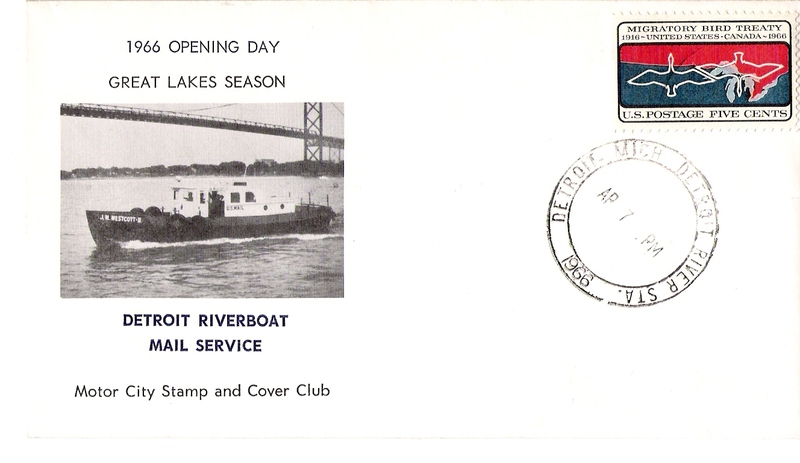 (See Detroit River Mail Boat History). Over 60 members range from 16 to 90 years of age, novices to experts – collecting well over 300 topical and/or related philatelic fields/topics. We are an active – “doing” group. We have fun with philately!!! In addition, we have and/or do cover the Detroit Gran Prix, Thunderfest Gold Cup Races, Tug Boat Races, Woodward Dream Cruise, Pope’s visit, local anniversary events, U.S. Submarine launch/commissioning, U.S.C.G. 9th District events and many more.